View More In Basal Thermometers. Why it take a long time (120 seconds) to get the Basal Body Temperature? It is a real measurement, not an algorithm value. It has a high accuracy temperature sensor to measusre the Basal body temperature step by step. First when put it in mouth, it will leave 10 seconds to suitable the mouth environment, then take a measure. After get the peak temperature, it will wait 10 seconds again to check that's the peak temperature. The Basal Digital Thermometer can help women track their menstrual cycle and ovulation period for family planning. 1.Germany technology sensor, to ensure get the accurate data. 2.Built in alarm clock: You can set an alarm clock, it will awaken you at the same time everyday without disturbing others to improve accuracy of predicting your ovulation cycle. 3.Large LCD Display: It has a large blue backlight display for easy visibility, even in the dark. 4.Auto switch off in 60 seconds after the last measurement. 1) Set date and time on thermometer. 2) Set an alarm on the thermometer to measure your basal body temperature at same time each morning as soon as you get up. 3) Plot your temperature on the included chart. A rapid raise in temperate indicates ovulation. The warranty is 1 year. Any problem within 1 year (except human damage), we will replace a new device. We are factory, we can offer you more and faster service. 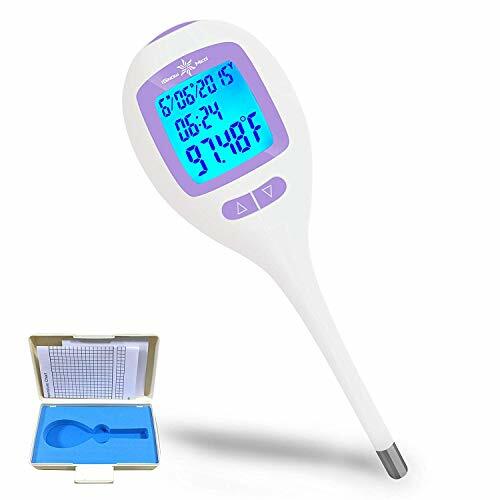 Specially designed for Basal Body Temperature, great for monitoring your Ovulation Cycle. Built in alarm clock, easy to set up,every morning at the same time it beeps. If you have any questions about this product by iSnow-Med, contact us by completing and submitting the form below. If you are looking for a specif part number, please include it with your message.